Daniel Mendelsohn wrote, “The writers we absorb when we’re young bind us to them, sometimes lightly, sometimes with iron. In time, the bonds fall away, but if you look very closely you can sometimes make out the pale white groove of a faded scar, or the telltale chalky red of old rust.” He was describing how Mary Renault’s books and her correspondence with him had influenced his life. He could also have been describing the physical scars of a survivor of lightening strike. I first read “Fire from Heaven,” and the “The Persian Boy” when I was 15 and Renault cast a literally spell over how I viewed my adolescent world. In many ways the characters and places she described continue to influence how I filter circumstance and the art I create. That is not what my image is about; just the opposite. It is instead about an idea or ability; a creative spark, received from an inclusive universe, that has no meaning without an appropriate receptor. It is about the gift and the gifted. It is about exceptional talent received and recognized as a gift from heaven. Renault was writing about Alexander of Macedon and the seemingly supernatural gifts he was born with. She was also describing gifts of friendship that we seek and that shape the physical form our aspirations take (in particular Alexander’s relationship to friend and lover Hephaestion). 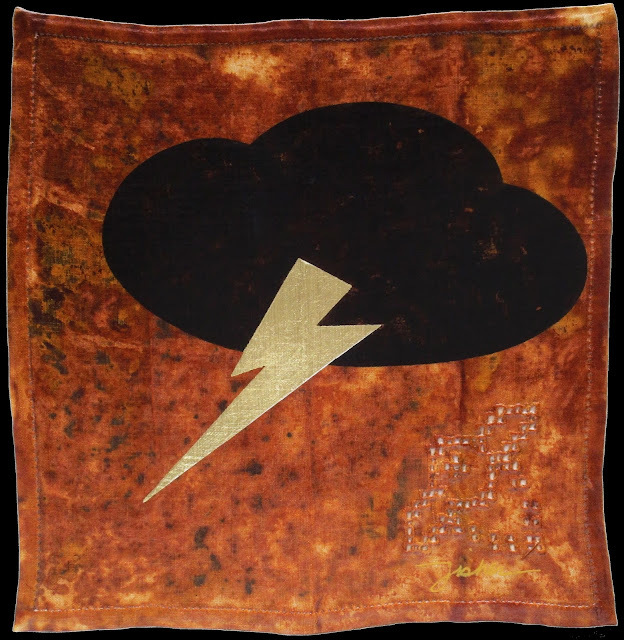 Fire From Heaven is a mixed media rust mono print on antique linen mounted to coped panel. All animals, plants, and fungi share an ancestor that lived about 1.6 billion years ago. Every lineage that descended from that progenitor retains parts of its original genome. 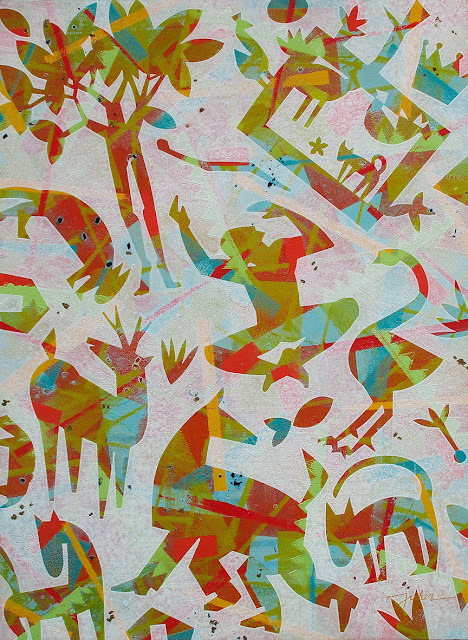 All Creatures Great and Small is my Monotype about all that we have in common with our fellow creatures. That includes of course the unique world that has shaped our evolution and the structure of deoxyribonucleic acid, the DNA that we share. Humans are most closely related to the great apes of the family Hominidae. We share 98.8 percent of our DNA with bonobos and chimpanzees. 98.4 percent with gorillas and with mice we share nearly 90 percent of human DNA. Humans and dogs share 84 percent of their DNA! No wonder I love my dog. She is me! Of course, humans, dogs, mice and apes are going to have DNA in common. They are all mammals. Humans and birds though are a different matter. Yet we, too, share a lot of DNA, 65 percent. We even share a quarter of our DNA with a grain of rice. Amazing! 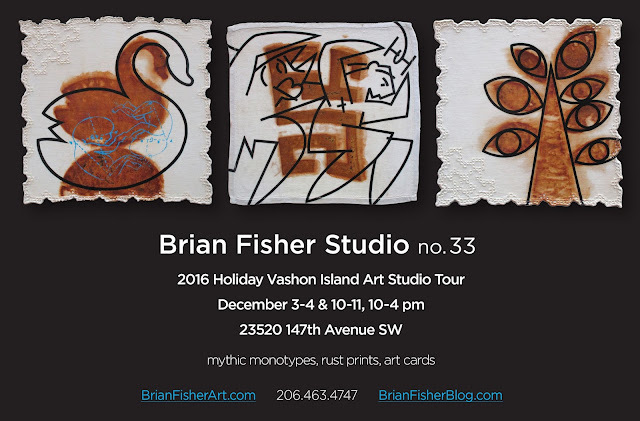 All Creatures Great and Small is on display during the Vashon Holiday Studio Tour in my own studio the first two weekends of December.